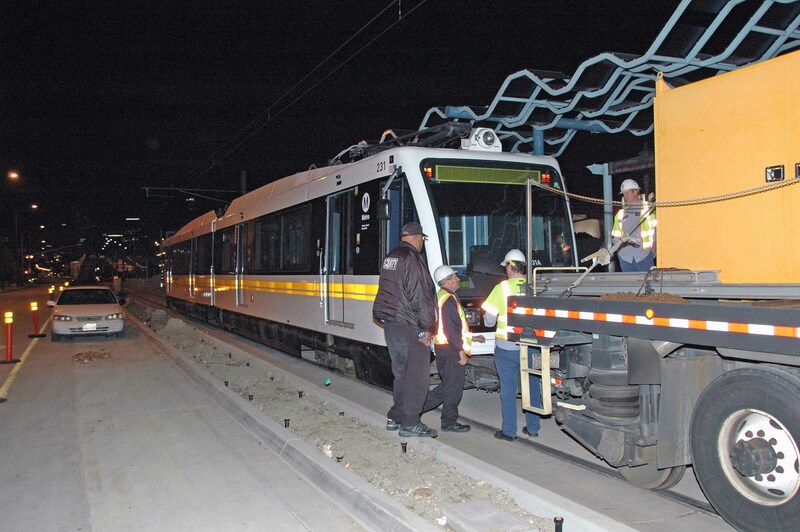 Metro Rail vehicles took to the new Expo Line tracks for the first time early Monday morning. In the above photo, the vehicles — which were towed by a truck — sit at the new station at 23rd and Flower streets. More testing will continue throughout the day. For more details, here’s the news release in an earlier post. What a sight to see! I cannot wait until we get this line operational! MORE RAIL! If only there was as much excitement about INCREASING THE BUS LINE SERVICE! What a milestone! See http://friends4expo.org for more photos, video, and links…. This is awesome, I take La Brea to work and progress has been visible. They shut down road for one week to fix and repave La Brea station. I am really looking forward to seeing Expo Line in action. This is going to be awesome, and eventually when this line goes all the way to Santa Monica people will finally have an option to go to the beach or to the city without taking a car. Can we get the 30 in 10 initiative going, there was so much talk about it last year and this year, nothing zip, like it never happened, this city needs this, more than others. Let’s get this thing built. I’m tired of delays, and more delays. The subway to the sea can wait. We need Expo,now! The route is not always pretty, but just like the Gold Line to Pasadena –from La Cienega to Santa Monica- It’ll be a pleasure ride with nice stops along the way. With any 30/10 money possibly coming, let’s not blow it. Let Mayor V. get something right for once in his life. Even though, we know it was never his original idea to begin with.